Occasionally I will buy canned pork mince with bean paste (香菇肉酱). I used it to braised tofu or as seasoning in fried noodles. I never think I actually can make the similar sauce myself. The main ingredient of this dish is bean paste. Make sure use the type lower in salt. I like my meat super soft so I cook it with pressure cooker. You can cook with ordinary pot/wok. Do adjust the cooking time accordingly. This is our quick dinner. Simply boil the ramen and serve with my mushroom pork mince sauce. 1. Heat up the cooking oil. Cook the pork till turn white. Follow by onion, carrot and mushroom. Stir fry till slightly soft and fragrant. 2. Add in five spice and bean paste. Stir to mix. Add water as desired (about 100ml). 3. Cover and cook till the meat soft (mine 5 minutes with pressure cooker). 4. Dish out and serve with your favourite noodles! 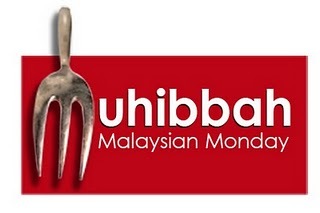 I'm sharing this post via Muhibbah Malaysian Monday hosted by Suresh from 3 hungry tummies. Oh the one in can is delicious! I'm quite scare to take canned food from China, this homemade one sound so healthy and safe! My hubby would love this! Looks delicious!